One of the most popular casino games, blackjack is loved by players for a reason: it is one of the very few casino games in which player skill actually has a word to say in the outcome. The house edge is not that big in the game to begin with (somewhere above 2%) and it can be reduced to around 1% by simply applying basic strategy. 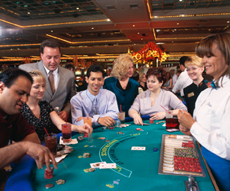 Basic blackjack strategy comes in the form of charts which tell players what to do depending on the dealer’s upcard and their partial hand. These charts can be learned by heart and there’s nothing in the world that will prevent you from using them at the live (or even online) blackjack table. One simplified version of basic strategy would be the following: knowing that the dealer has to hit on any hand below 16, it becomes obvious that you won’t ever win with a hand lower than 17, unless the dealer overshoots the mark and busts. If he has a card from 8-A, you should hit on any such hand, because the dealer is not likely to bust with such an upcard. If he has 4,5 or 6 though, you should stand as these hands make him bust around 40% of the time. There are several other ways to reduce the house edge on blackjack, to fine tune your odds and eventually to turn the tables on the house completely. One option is to register for an online casino which offers you a generous rakeback like loyalty system. Such comp point systems poker rakeback in the sense that they give you a rebate on the money you wager – go to Rakemeback to learn more about rakeback) exist in live casinos too. No matter how stingy they may seem, they do reduce your house edge a little bit more. Find the right table to play blackjack. That means you should double-check a variety of factors, like the stacks in front of players (which carry clues to whether they’re winning or losing), the general mood at the table, the minimum and the rule variations that may offer you an advantage. The minimum at the table shouldn’t be bigger than 5% of your entire stack. Even if you manage to secure an edge over the casino, you’ll need to play several hands to make that edge work. If players are allowed to double down on any two cards, that is one table rule that offers them an edge. Another such rule would be the one concerning the dealer having to stand on a soft 17. You may not understand why these rules are helpful for you, but believe me, they are. Make sure the dealer has your best interest at heart. The way you can achieve this is by placing the chip which you intend to hand to the dealer as a tip, in front of your circle, turning it into a side-bet. If you win, the dealer doubles his tip. Learn card counting. There are several different types of card counting techniques, some more intricate than others, but all of them centered around the fact that an abundance of high cards (10-A) in the remaining deck offer the player an advantage. Some of these card counting techniques are really simple. The player assigns values of -1, 0 and 1 to different cards. All he has to do then is to keep a sum in mind and to update it every time a card leaves the deck. The sum will then offer him a valuable clue concerning the density of high cards in the deck. If that density is good, the player’s bets should be bolder than otherwise.
" Hi, I just wanted to drop you a line and say thank you for how much money you have made me." " Tremendous value package - I love all this sort of stuff." Colin Bond, London U.K.
$150-$200 per session of 45 minutes to an hour. I am impressed with the results." 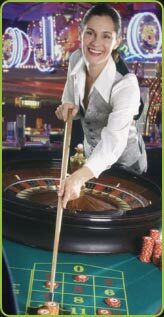 " Richard, I am still winning with your roulette system. I'm up another 730 units! " " I think it is great what you are doing! Thanks, "
(it's the best) It's a slow but steady grind, but I have NEVER left the tables a loser.
" Thank you, Mr. Graham. You've certainly given me more than my money's worth!" " ... won over 5 thousand bucks with your system." These are personal individual experiences. Yours may vary.es. Yours may vary.